If you’ve been following this blog you’d recall me saying fatigue is slow poison. After this game I can pull out five other words that would be more precise but unsuitable for public use. Christmas/New Year has never been easy on premier league coaches, the constant barrage of games can make unaccustomed coaches lose their suave – ask Pep if you doubt me. Mourinho’s biggest challenge during this period will be fielding fit players who are right for the job. Here’s a bit of what Superman caught with his bird-eye view.. The fatigue is catching up, and fast. Zlatan was practically strolling around the West Ham’s box when play did not involve him. He couldn’t be bothered with falling back to pick the ball or waste energy making a penetrative run that might not be picked. Even his goal, which was offside by the way, fell to his feet for him to put enough power behind his shot to beat Randolph. Still on that list, though not as bad, were Valencia, Mkhitaryan, Pogba and Herrera. The latter was the most energetic of them all and it was obvious our midfield lacked its usual bite. If not for Ferghoulli getting a red card United might have struggled to win this one. Let’s talk about Mourinho for a sec yeah? If ever ‘the special one’ was a nickname randomly given to him, he proved it right against the hammers. The team had 5 changes from that fielded against Boro on Saturday. Rojo and Jones returned to the heart of defence with Darmian playing their left flank. Carrick was restored to the pivot of the midfield while Lingard replaced Anthony Martial in the team (I assume in anticipation of coming games). From kickoff the team played like they got hauled out of bed early and West Ham was just fine with that. Our most pressing issue in the first half asides fatigue slowing down key players was Darmian who was getting torn apart by West Ham’s wingers, Antonio and Payet. Noting this, Mourinho didn’t waste time yanking him out at the start of the second half to introduce Juan Mata. Not only was this an absurd change but now we had to make do with Carrick as centre back and Rojo as left back, meaning our attack got a boost at the detriment of our defence. Still it was effective enough to calm West Ham’s upsurge of attack as they had to fall back to contain our play, now enhanced by Juan Mata. This change saw Pogba and Herrera sit back as double defensive midfielders with Mata just ahead of them in the No. 10 position. Twelve minutes later the once again inconsistent Lingard was replaced by Marcus Rashford, immediately causing the Hammer’s defence a lot of trouble. 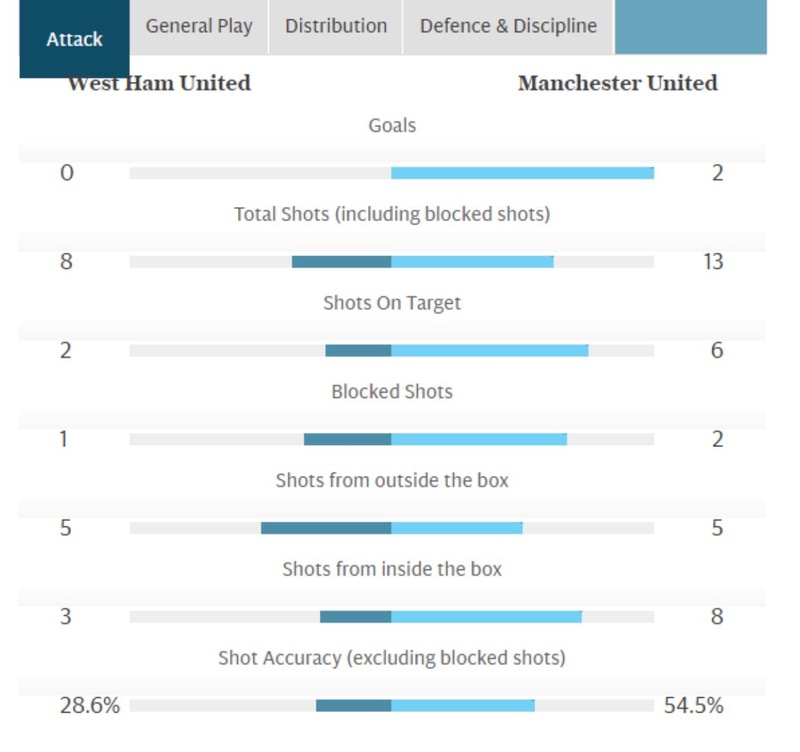 United were still susceptible to counter attacks, which had become West Ham’s last resort. Mourinho eventually brought in Smalling in the 65th minute to even things out, withdrawin Mkhitaryan who was exhausted at this point. All this while our midfield had stabilized thanks to Mata and Rashford who took creativity pressure off Herrera and Pogba. It might sound basic enough now but it made no sense to anyone initially when the changes were made. And as if to make a point, Mata scored the first goal from a Rashford assist. And for those who slandered Ibrahimovic remember the man is old, has played every game in the EPL this season, was obviously exhausted and is still one goal shy of Diego Costa’s 14 despite having his last goal controversially cancelled. Till next time, from the man bringing you the bird’s eye perspective.